Live cellular localization of GFP-tagged PfSWIB within Plasmodium falciparum. 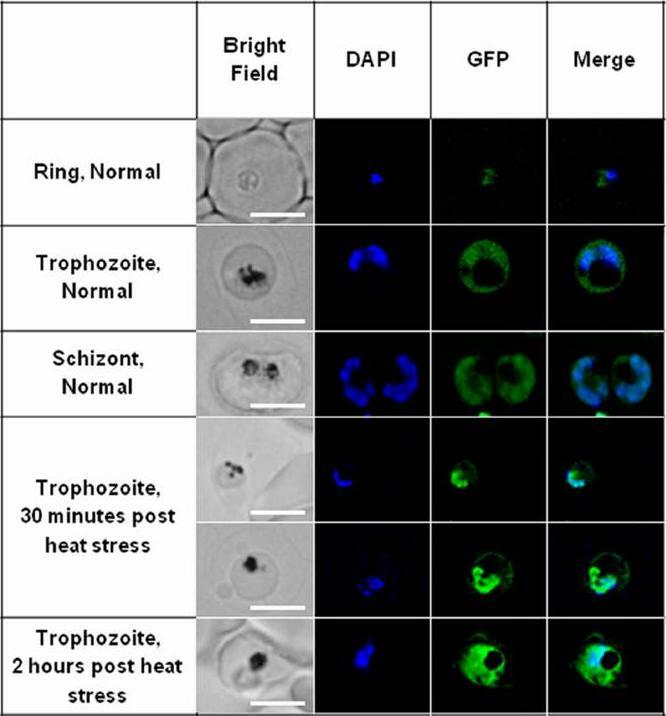 A distinct cytoplasmic GFP signal was observed in all life stages under normal conditions, whereas exposure to 41 °C for 2 h resulted in nuclear localization, 30 min after termination of heat stress. This redistributionwas short lived since a nuclear signal was absent 2–24 h afterwards. R ring stage, T trophozoite stage, S schizont stage. Scale bar in bright fieldrepresents 2.5 μmVieira WA, Coetzer TL. Localization and interactions of Plasmodium falciparum SWIB/MDM2 homologues. Malar J. 2016 Jan 20;15(1):32.